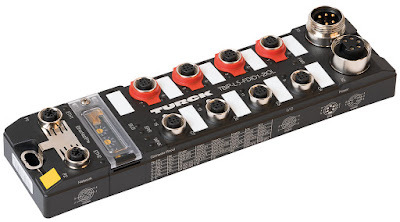 Adding to their collection of fieldbus technology products, Turck has announced the release of their Hybrid Safety Block I/O Module for CIP Safety over EtherNet/IP. Turck's hybrid safety concept combines both safety I/O and general purpose I/O in a single, rugged, on-machine, remote I/O device. The CIP Safety (TBIP) module expands the existing hybrid safety offering, which already includes an option for PROFIsafe over PROFINET. Both IP67 hybrid modules can be adapted to the actual signal requirements of an installation through the use of configurable input/output points and by leveraging the flexibility of IO-Link. On the safety side, the hybrid modules offer two safety inputs for connecting safety sensors, such as light curtains or emergency stop buttons. Two additional safety channels can be used as either inputs or outputs. The general purpose (non-safety related) side includes four configurable discrete inputs/outputs capable of switching up to two amps when used as outputs. Two IO-Link master ports are also available, which offer an additional 32 points of configurable discrete I/O when used with Turck IO-Link hubs. These devices can be used as remote safety I/O, or even operated as a standalone safety controller for local safe I/O. This allows the implementation of safety functions without the need for a safety PLC while still providing safety diagnostics and general purpose I/O data to a higher level non-safety PLC. For questions, or for more information , please contact C&E at 800-228-2790. Thank you!